Cysticercus cellulosae: Silent killer in pork. Think twice before eating it. 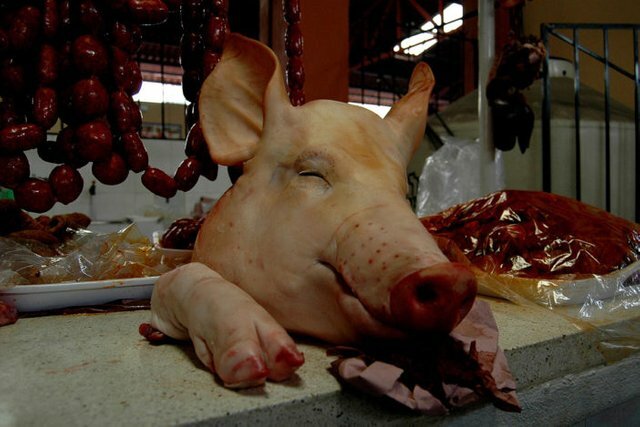 Hi, Steemit today I will talk about one of the most frequent parasitic diseases of the Central Nervous System (CNS), caused by a deadly parasite, the Cysticercus cellulosae, which comes from pig and affects 2 to 4% of the general population, but with more often in countries that consume pork as often as China, Mexico and other countries of Latin America. However, cases have been found in the United States, noting that it is not exclusive to these countries. In this post we will see how this disease is spread and how dangerous it can be. This disease is generated when the man is infected by Cysticercus cellulosae, which corresponds to the immature stage of the parasitoid Tenia sollium or also known as human solitary, this parasite is formed by a head, which has a double crown of hooks and four suckers, as well as a neck and a body formed by hundreds of proglottids. This parasite has 3 stages of development: adult (worm), larva (cysticercus) and egg. Each parasite is capable of releasing up to 50,000 eggs. 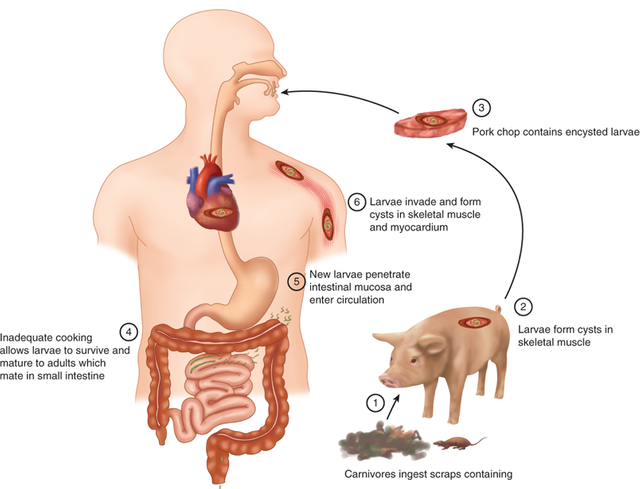 The final host of this parasite is man but uses the pig as an intermediary, these pigs are contaminated with eggs excreted in the feces of infected humans, these eggs release oncospheres that are located mainly in the skeletal muscle of these animals, thus generating consume contaminated pork this parasite manages to enter man by adhering to the intestinal mucosa, crossing the capillaries and traveling through the bloodstream to be deposited preferably in the brain. The cysticerci must survive in the organs of the host during weeks or months to be able to complete their vital cycle. For this they have mechanisms of evasion of host immunity such as mimicry and immunosuppression. The contagion with this parasite is generated mainly by inadequate hygiene and health habits. Eating in stalls, eating poorly cooked pork and not respecting refrigeration times are some of the practices that favor infection by the parasite. These parasites on reaching the brain cause neurocysticercosis, which is characterized by multiple symptoms that depend on the number of larvae installed in the brain tissues. In the brain we can find two types of cysts. The racemose cyst is cluster-shaped and can measure up to 10 cm in diameter, and the cellulose, with an oval or rounded shape and can measure 3-20 mm in diameter. These cysts cause a large inflammation of the adjacent tissue, which then becomes fibrotic tissue and finally a calcified nodule that is clearly seen in the tomographies, giving the appearance of symptoms such as severe headache, seizures, hydrocephalus, epileptic seizures, vision blurred, confusion, cerebral infarcts and finally death; however, these symptoms can take years to appear, acting as a silent killer and destroying all brain tissue without warning. For these reasons think twice before eating pork. If you liked this moment curious, upvote and reesteem! Nogales-Gaete, J., Arriagada, C., & Salinas, R. (2006). Tratamiento de la neurocisticercosis: Revisión crítica. Revista médica de Chile, 134(6), 789-796. Imirizaldu, L., Miranda, L., García-Gurtubay, I., Gastón, I., Urriza, J., & Quesada, P. (2004, August). Neurocisticercosis: Una enfermedad emergente. In Anales del sistema sanitario de Navarra (Vol. 27, No. 2, pp. 201-209). Gobierno de Navarra. Departamento de Salud.